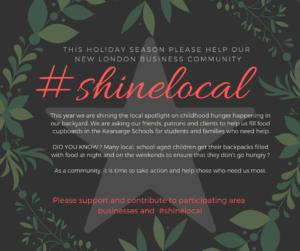 MRFC will #shinelocal this holiday season and we ask all our club friends and family to assist in stopping childhood hunger in our community!! DID YOU KNOW that many area children get their backpacks filled with food every night and on weekends to assure they do not go hungry?! Let’s make a difference MRFC! Either bring in a non-perishable food item, add a donation to any MRFC purchase, round up your MRFC purchase or donate directly to us at MRFC! WE CAN MAKE A HUGE DIFFERENCE IN THE LIVES OF KEARSARGE AREA CHILDREN!! Previous Post Previous post: Winter Class Cancellation Policy! Next Post Next post: Net Generation Jr Tennis TODAY…CANCELLED!!! !